Subscribe to our Newsletter for products update! Truffled Salami or Salame al Tartufo is the ultimate luxury when it comes to the charcuterie platter. Mr Truffle’s cured meat and cheese selection is the true definition of artisan quality and taste. They are made from family recipes handed down over generations and the curing process overseen by expert artisans, according to the best Italian tradition and expertise. This truffle salami is really something to experience. 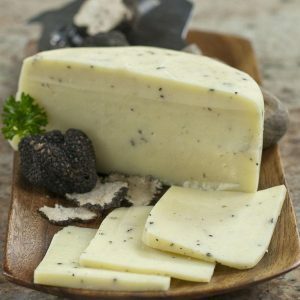 It is made by artisan experts at F.lli Costantini Salumificio in the Abruzzo region, is cured with real pieces of Italian truffle to give a much fresher, fuller taste. 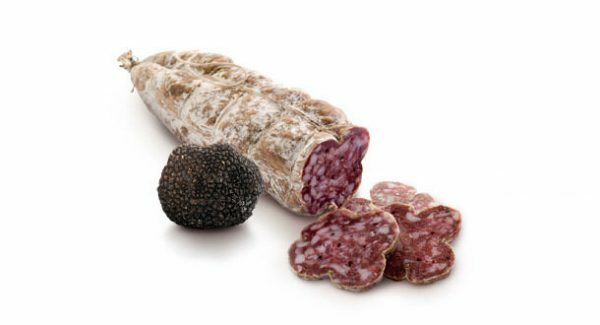 Most truffle salami are simply infused with truffle aroma and flavourings. F.lli Costantini uses only the finest pork, truffles and herbs and the combination of flavours and aromas really shines through. Not so easy to find in the UK and a guaranteed hit at the dinner table! Excellent as an antipasto, with cheese or in a wild rocket salad. Also makes a great gourmet sandwich! These 250g pieces of finest grade salami are speckled with summer truffle pieces and give off that wonderful truffle aroma that is subtle and not too over powering. These make for a wonderful gift, stocking filler or ‘Thank you’. They will not break the bank and are great value for money. They also have a 6 month shelf life! Customer satisfaction is a priority for us. Therefore, our quality control is extremely rigorous because our reputation depends on it. All the products we supply are carefully checked before dispatch, which is why we confidently offer our 100% money back guarantee if you are not satisfied with the quality.